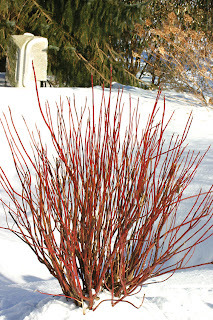 The Red-Osier dogwood, Cornus sericea (syn. C.stolonifera) is North America's native answer to the Siberian Tatarian dogwood, Cornus alba. Found growing from Alaska and east to Newfoundland, in any moist location. The common name originated from its use in basket weaving and wicker work, where it was referred to as a red willow. Willows are often called 'Osier's' and the name has become interchangeable between both dogwoods and willows. 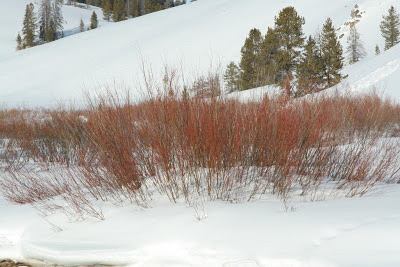 The Red-Osier was prized amongst many native American Indian tribes for its use in an array of different purposes. The inner bark was processed and dried for mixing with tobacco in scared pipe ceremonies. It is said to have a mild, pleasing smoke that is not addictive like tobacco or causes any mood changes. The Potawatomi people who live in the upper Mississippi river region, used the stems to make dream catchers and once used the feathered ends of its twigs as toothbrushes. Just like the Tatarian dogwood, bows and arrows were popularly fashioned from its long, straight stems. Apart from weaving, weaponry and dental hygiene, red-osiers were also used for their medicinal benefits. Infusions were made from the bark and used as an anti-diarrhea tonic by the Chippewa and Potawatomi tribes. Shuswap's Indians also created antidotes for weak kidneys and pediatric tonics for children who wet the bed. The Chippewa people used red-osier dogwood bark to make an infusion to ease blistering caused by poison ivy, one I need to look into. People aside, wildlife also prize red-osiers for more than just cover to hide in. The berries ripen in late summer and may persist on the plants well into winter. The list of birds known to seek out the berries too long to go into any detail but I have included a link at the end of this post for more reading. The twigs and foliage are valued for nourishment by our four footed gardening friends , much to the disdain of any gardener, unless your goal is to attract wildlife. This includes many american iconic animals that include, black bear, beaver, raccoon's skunks and of course deer! For some other lucky gardeners you can also include elk, mountain goat and the mother of all foragers, the moose. Do not despair, red-osiers are able to overcome heavy browsing and bounce back quickly to its former glory. However, the reason for this post is to highlight its great value as a garden shrub and many fine varieties have been selected for their ornamental characteristics. Just like the Tatarian dogwood, it doesn't favor heat or humidity of the south, but instead prefers colder locations more to the north. Those of us who live in zone 7 should be good but any further south could be problematic. Below is a list of varieties that have found there way into the garden center and succeed well.. As you'll see, there just as diverse as the last group, offering many different choices for the landscape. 'Arctic Fire', (Farrow) is a compact dwarf, non suckering form that makes it ideal for smaller gardens. Unlike most red-osiers that can grow to 8 ft, this one will stay around 3-4 ft. 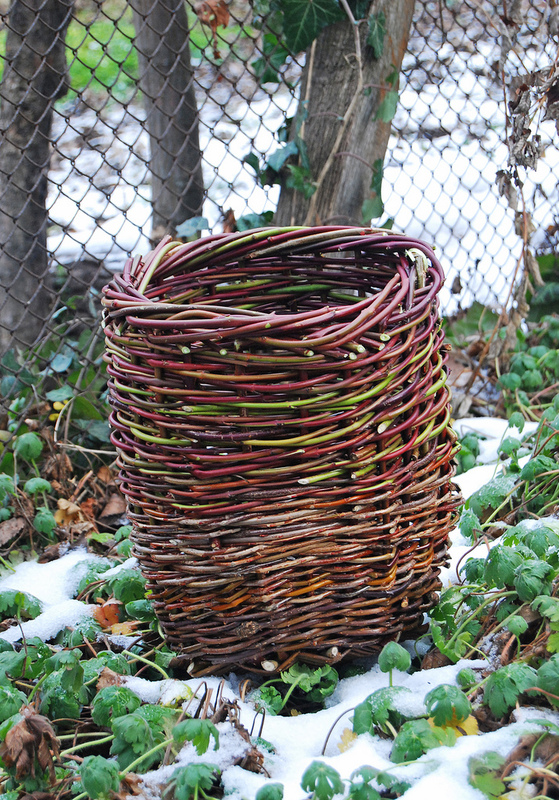 The dark ruby red stems glow all winter, providing a welcome treat after other plants have faded out. In spring, fresh green growth covers the stems and allows emerging perennials to use its form as a backdrop. ‘Cardinal’ by far is one of my favorite variety on the market. 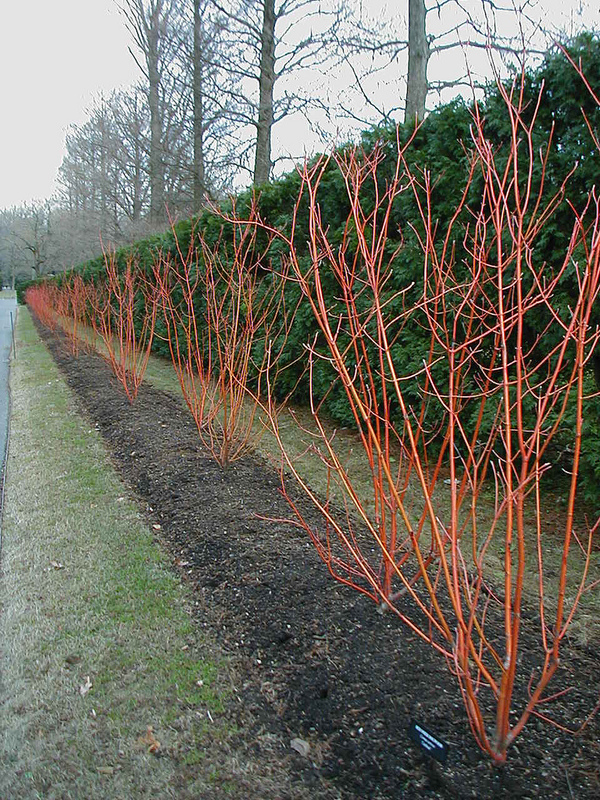 The stems ignited the winter landscape with its fiery red coloration, but in southern locations the stems can take on a yellow to orange tone giving them the appearance of a blood twig dogwood. The dark green foliage also turns a rich purple-red in fall, alerting people to its presence before revealing its grand show. Somewhat more disease resistant then others, this variety can grow tall to 8 ft, but manageable with pruning. 'Isanti' is a good, reliable, compact grower to 5 ft with a neat and full habit. 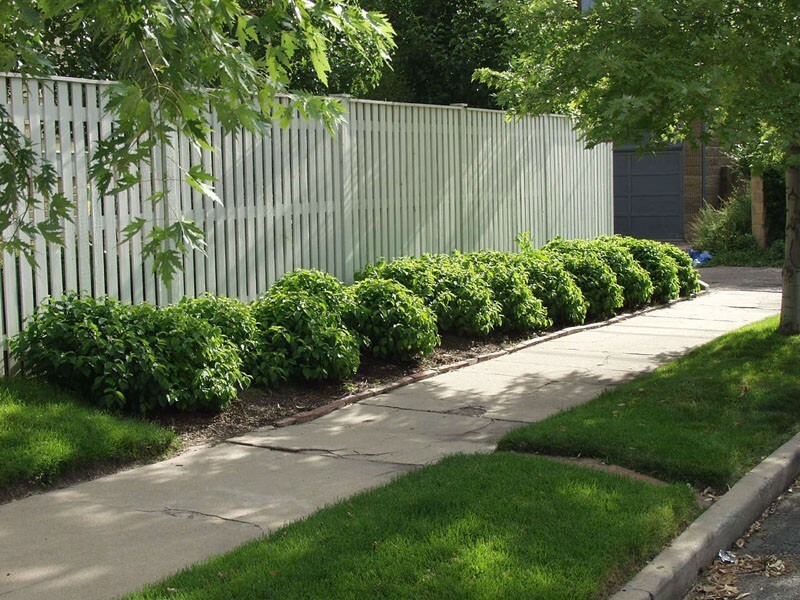 Its growth fully covers the stems all the way to the ground so doesn't need landscaping in front to hide of its naked ankles like other shrubs. This makes a good choice for screening or hedging. Its main use is in reclamation work, where its fibrous roots and spreading habit is good for retaining soil on highway embankments in the north. Not a glamorous job description but nevertheless a beauty when seen in mass, naturalized on the side of the highways or our own backyards. 'Kelseyi' was until recently, one that I always skipped over, favoring other dwarf types instead. However, this year I ordered some in for a customer and was smitten by its character. Now firmly on my wishlist of my own garden for 2013. Its small and compact (2-3 ft) habit makes it s good choice for mixing in the front of borders, tucking it in with perennials. 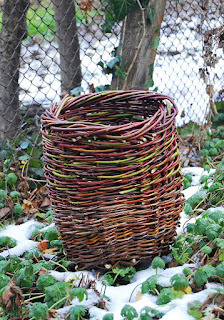 During the winter, when the perennials go dormant and disappear into the ground, 'Kelseyi' will carry the show with its bright red stems until spring thaw awakes the garden again. 'Silver and Gold' is a variegated sport from the yellow twigged 'Flaviramea'. Originating from the famous gardens of Delaware's Mt. Cuba, this variety showed better adaptability to heat and humidity of the mid-Atlantic region. The bold creamy white leaf margins stand out in summer, but is replace in the fall by striking lime-green to yellowed stems. The variegation is similar to C.alba 'Elegantissima' or 'Ivory Halo' as discussed in the previous post, making a good choice for those looking to combine red and yellow stemmed dogwoods. Cultivation of Red-osiers is no different to that discussed before with Tatarian dogwoods. Both types need to be reduced periodically to regenerate young growth that contain the best color. Spread can be controlled by cutting back suckers or root pruning with a spade to prevent the spreading, stoloniferous shoots. Though tough as old nails in the landscape, some disease issues can be problematic here in the south. For me, a common problem is bacterial leaf spot and stem blight. Making sure they have good air movement around the plant in summer and preventing irrigation systems from getting the foliage frequently wet will largely reduce the disease risks. Thinning out the old and congested growth will improve air circulation as well as regenerating the plant again. As always, prevention of fungal or disease attacks is better than treating once you contract it. Spraying after the fact will only help prevent the spread onto new growth and not necessary turn around infected areas. 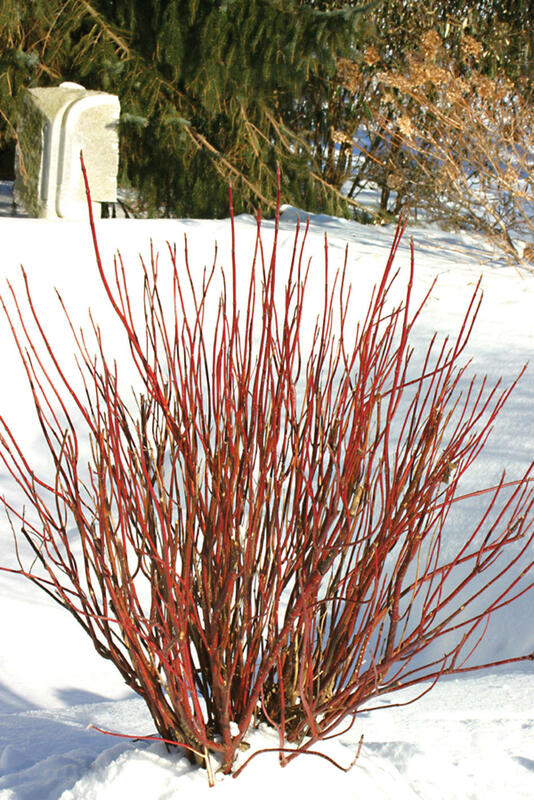 In the last part of this three part series we'll delve into one of the most striking types in the winter, the bloodtwig dogwoods. So until then, I hope that you've been bitten by the allure of dogwoods to the point of planting one for yourself. I love learning about these plants and seeing how each variety differs. So glad you included my own favorite, 'Isanti' which grows well for me. They did get browsed heavily when my plants were young, but it did not set them back, just eliminated the flowers, which actually are very nice, even though blooms are not the main attribute with redtwigs. Believe it or not, the redosier is listed as deer resistance on some websites. I've known that they like to nibble on the young, tender growth but when it thicker than a pencil then they leave it alone. Blog on for 2013! The best way to learn is to teach, at least someone once said that to me and it sounded good. Keep playing the lottery and wishes may come true. I am interested to know more about the root systems on these plants. The Kelseyi and Arctic fire are of most interest to me. Would you classify them as an aggressive or passive root, ie will they break underground pipes or go around? Also what is the average root depth on these plants? I would love to use them in my new yard design but I have an in ground irrigation system and utility lines to consider.